If you are old enough to have been in the workforce for a couple of decades, you’ll recall a time when recognition programs were about getting a pen or a clock with a company logo on it. Regardless of your contributions, if you hung around long enough, you’d get your “recognition” gift. But, times have changed. Years of service don’t mean what they did 20 years ago. So, the recognition programs of old have tried to adapt. Instead of tenure, today we value performance or innovation (although tenure is still alive and well in some corners of the business world). Instead of pens and clocks, in today’s recognition programs, it’s gift cards and electronics. In the more progressive models, you are granted points that can be used to “buy” said gift cards, electronics, and other miscellaneous stuff. Instead of the program being managed by a HR administrator, it’s online in a slick-looking, web-based system. Employee recognition is all grown up, right? Not so fast. In the race to create the coolest, hippest recognition programs on the planet, I think we may have lost focus on what we are trying to accomplish. The root of the word recognition is recognize. When you hear the word recognize, what comes to mind? In everyday language, it’s meant to suggest that we are seeing something we’ve seen before. It’s an act of acknowledgement. Recognize: verb. To perceive as existing or true; realize. Turns out, it’s not about free stuff – at least not directly. It’s not even about incentives or motivation. It’s about being seen, being acknowledged by someone else as existing, as real. I think it’s time to step back from our race for the best rewards and recognition platforms for a moment and consider what we are trying to accomplish. Based on our analysis of 400,000 unique employee responses from nearly 5,000 organizations in our Best Places to Work programs in 2013, here are a few things we heard from the workforce: (You can download the entire 2014 Recognition Trends Report here). If you care enough to recognize me, I am far more likely to be engaged at work and you’ll get a better effort from me. If you are going to give me something, give me MONEY in the form of a raise. If you aren’t going to give me money, invest in my development and give me more autonomy and flexibility in how I do my job. It matters to me that the senior leaders of the organization recognize that we are doing our best to help the organization succeed. Piling extra work on me and calling it “recognition” is getting old. Unless it’s a promotion (including more money) or truly a developmental opportunity, I’ve got plenty of work to do (thank you very much). 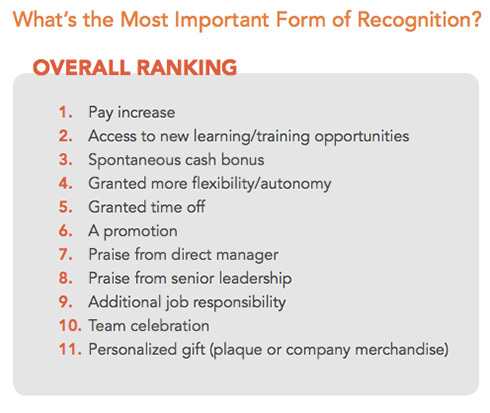 It’s time to refocus our efforts related to employee recognition. 1. Recognize that employees are human beings. That means that each one is unique and complex. What is motivating to one person is likely very different than their peers, I know that’s certainly true for me. The only way to know what type of recognition an employee prefers is to ask them. There is no shortcut. It’s probably safe to assume they would take a raise if you offer it. It’s the other types of recognition that require the hard work. Training your managers how to have this conversation and acting accordingly is a great place to start. 2. Recognize employee efforts, even when they aren’t extraordinary. I know, I know. We’ve been conditioned to think that employees shouldn’t be recognized for just showing up and doing what’s expected. “That’s what they are paid to do.” The problem is that the vast majority of your employees are doing average work by your standards – that’s the definition of average. And that’s not going to change. Want to turbo charge engagement? Show people gratitude. Tell them that you notice that they are making a contribution and you value their work, extraordinary or not. 3. Recognize that it’s not really about the free stuff, it’s about making sure employees feel seen and valued. Employees will always take free stuff when you offer it. That’s human nature. While it’s fun to read about perks and cool giveaways that organizations offer, that’s not what drives employee engagement. There’s more going on than meets the eye. Consider supplementing your recognition investment with efforts to create a cultural shift towards acknowledgement and appreciation of each other’s contributions. Simply encouraging people to say thank you and show appreciation at all levels can go a long way. The moral of this story is that recognition is powerful, but I think most of you probably already know that. Recognition is a key ingredient to creating a workplace that drives engagement. But, most of us are going about it the wrong way. Make your recognition efforts about consistently and authentically acknowledging the efforts of employees at all levels, and your employees will reward you for it. 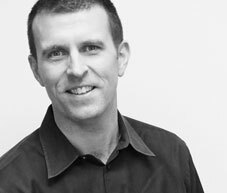 Jason Lauritsen has been described as “a corporate executive gone rogue.” For nearly a decade, he spent his days as a corporate Human Resources leader, where he developed a reputation for driving business results through talent. As the Director of Best Places to Work for Quantum Workplace, Jason’s quest is to identify, recognize, and support awesome workplaces through the Best Places to Work national contest. He is a passionate, engaging, and thought-provoking speaker, who consistently scores high marks from his audiences as an accomplished and well-traveled keynote speaker.